“Woobie Sprouts” Detail, 2014. Mixed Media. 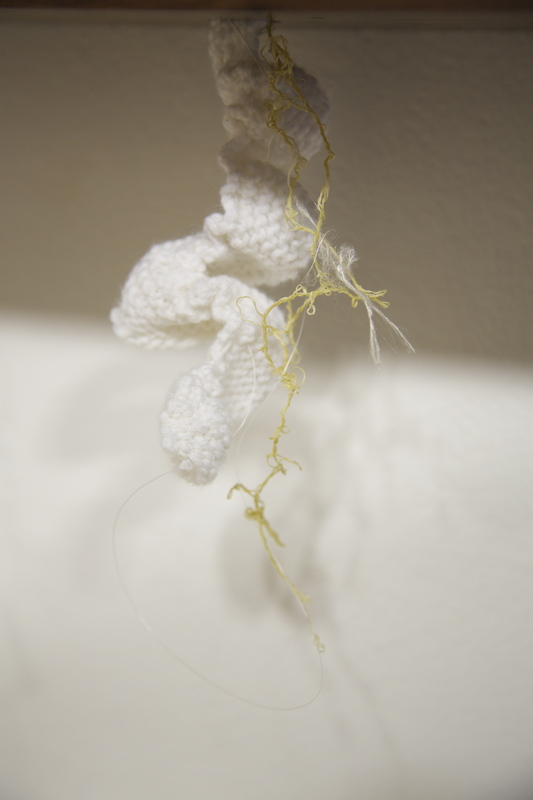 Starting in September of this year, I began my MFA studies in the Fiber Department at Cranbrook Academy of Art. With the end of the first semester in sight, I have come to a time of reflection on the first few months of earning my MFA. Over the last three months, I’ve been able to devote myself fully to my studio practice. I found Cranbrook’s program to be most pleasing for this aspect, as there are no scheduled classes. While attending various seminars, reading groups, and working in my studio, I was able to finish a handful of works and formulate the foundations for future works in progress. My studies have been on a similar path of the exploration of comfort; however, the approach to research has changed slightly upon entering the Fiber Department. 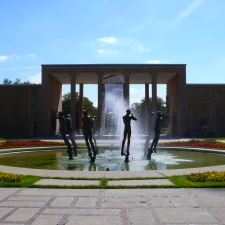 While working in a sculpture department, the focus was more upon the concept rather than the material. Being part of the CAA Fiber Department has challenged my ideas of what a woobie is, how it functions, and most of all, the materials in which woobies can be fabricated. 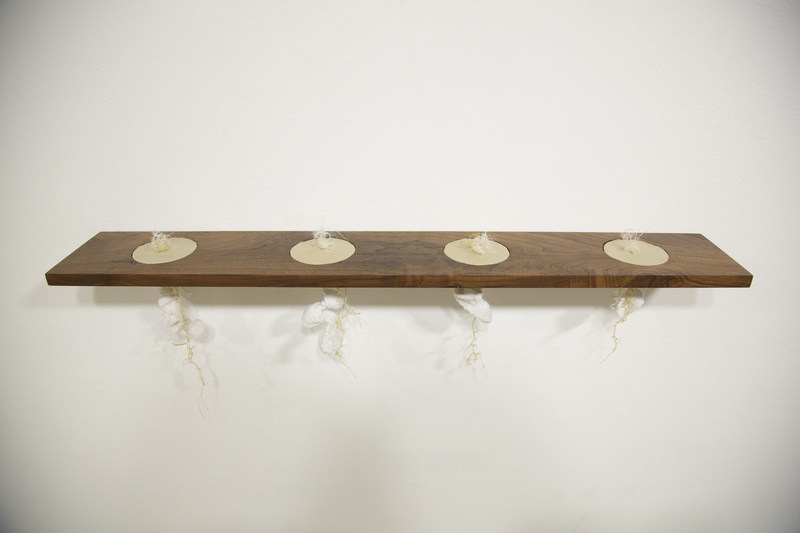 The first work created during my studies at Cranbrook challenged my woodworking abilities, along with the materials used to create the woobies, and their process of activation. As seen in the image above, the woobies took the form of what looks to be a sort of botanical sprout, or skin and hair follicles. The sprouts push through the barrier to reach the surface and greet the viewer, all while the multitudes of networks weave in and out of one another to create the foundation. In making this work, I began to contemplate the system beneath our skin and how it reacts in moments of stress. I was curious how that particular activation could be portrayed through a woobified network, while also staying close to the core interests. “Woobie Sprouts”, 2014. Mixed Media. After this exploration, I began to be curious of the materials that could be used to make woobies. While previous woobies have relied heavily on white acrylic, I began to form a desire for more material options and how their physical properties would alter the comfort of the woobie. This sparked the next work, “Woobie Bible”. This work serves as an ongoing collection of samples that have been deemed to have “woobie potential”. From strands of fiber, to fabric and knit samples, these bits have been given the approval of delivering the utmost comfort when interacted with in a tactile manner. This work has yet to be photographed, but will be documented shortly. 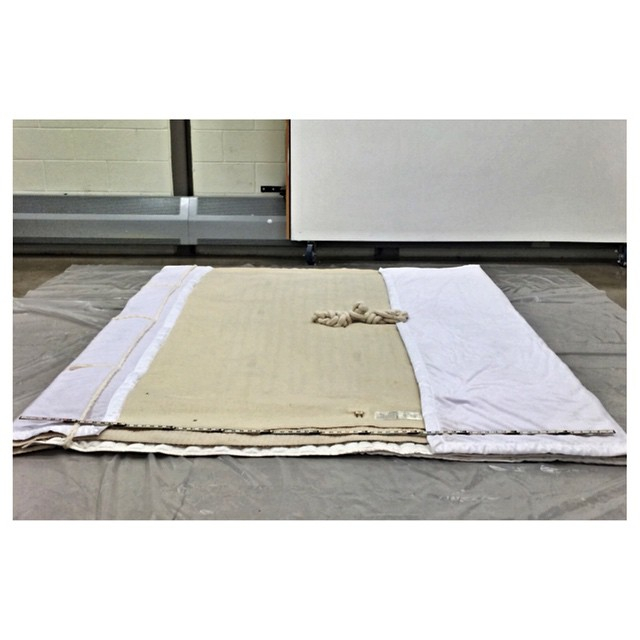 In Process Studio Shot of “Woobie Diary”, 2014. Recycled Fiber, Embroidery Floss, Thread. It was after making the “Woobie Bible” that I began to desire to document my personal woobies in a large, interactive way. I began working on the next work entitled, “Woobie Diary”, at this moment. Through collecting materials of woobie potential in the form of blanket, I created a sculpture that is large enough for the viewer to crawl into and begin to activate the comforting experience. While I consider this to be a piece, I also cannot deny its performative qualities. 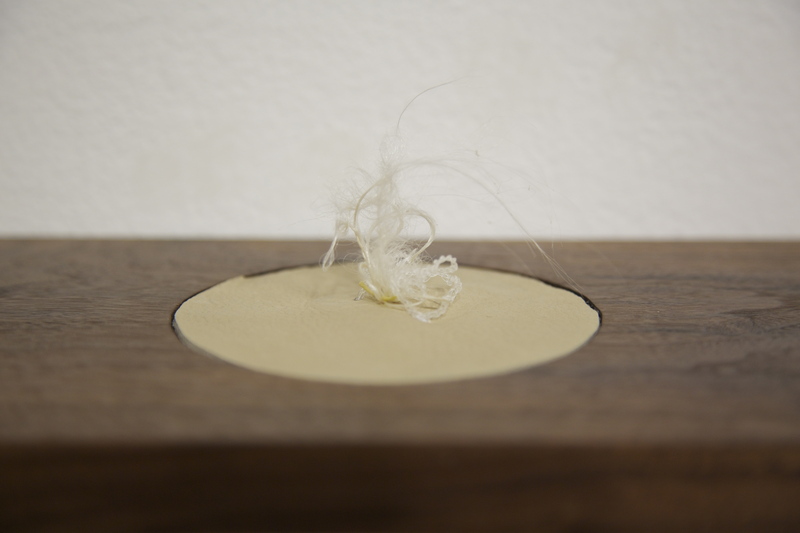 Within the next month, a performative video and film stills will be finished to complete this work. “Woobie Sprouts” Detail. 2014. Mixed Media. This post is a list of the various places I’ll be showing/making work during the months of April-September. If any of you who follow are in the area, please try to stop by and support the other emerging artists with whom I’ll be showing! It’s absolutely amazing to me that my time in DAAP (Design, Architecture, Art, and Planning) at the University of Cincinnati is almost finished! 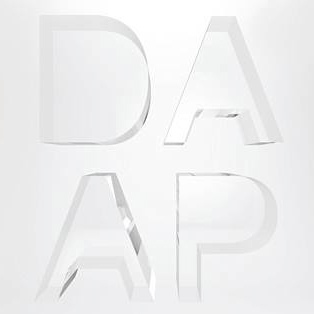 The exhibition, DAAPWorks 2014, is a culmination of all the hard work that the graduating seniors from all departments have been working on over the last year. There will be models and other work from Design, Architecture, and Planning, and two galleries showing the senior thesis works from Fine Art, along with the CAC showing the work of the Graduate Fine Art students. The opening of DAAPWorks 2014 is April 22nd, from 5-9PM. Please stop by if you’re in the Cincinnati/Tri-State area! Work by Joe Girandola, Professor at DAAP, 2013. 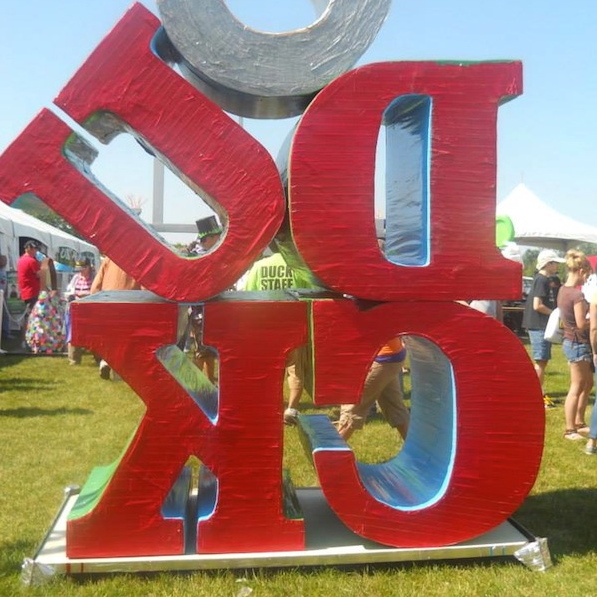 The Duct Tape Festival is new to the area of Avon, Ohio, but has surely made a name for itself in the area. This festival that is held during Father’s Day Weekend is a celebration of the tape that can do it all! People from all over come to celebrate this product, participate in the free activities, dress in Duck Tape outfits, and best of all, to see our larger than life sculptures. For 2014, the theme is “Out of This World”. The sculpture students in DAAP who are in the Duct Tape Class have presented ideas to the Duct Tape Company, which are being approved and funded to be shown in the upcoming festival. I am creating a Space Rover, with the help of my partner (Mary Baxter). If you’re looking for fun Father’s Day (June) plans, come to Avon, OH for our “Out of This World” art! I’m so happy to announce that during the weeks of July 5th-19th, I’ll be a studio assistant at Penland School of Crafts for the Screen printing on Fabrics class. 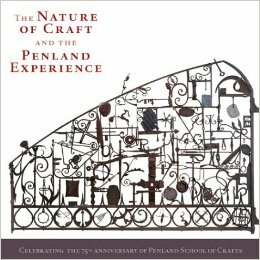 For those who are unfamiliar, Penland is a school dedicated to the arts and crafts skills that is located in North Carolina. It has been running for around 75 years, and is about an hour Northeast of Asheville. I’m very much looking forward to working with the Studio Coordinator and the students in the class to perfect our screen printing skills and create some lovely works of art. In my last post, I mentioned my acceptance to Cranbrook. In this post, I’m thrilled to announce I’ve accepted the offer and will be moving to Michigan to attend their Fiber Program and earn my Master’s Degree. The transition is very exciting; but I’m a little nervous for the move. I intend to create as much new work as possible during my two years at Cranbrook, and continue to show my work as often as possible. I’m excited about the potential following my work will gain upon moving to the Detroit area, which would add to my growing following in the Cincinnati/Tri-State area. The opportunities I’ll be able to experience over the next few months (and in one case, 2 years) are better than anything I could have ever imagined for myself. Hard work and an optimistic outlook can take you anywhere, and I’m surely happy as to where it’s taken me and my work. This weekend I took a trip to Chicago for a Portfolio Viewing Day that was being offered by the School of Art Institute of Chicago. If I am not mistaken, there were around forty school present from around the country that were looking for potential graduate students for the Fall of 2014. There were four schools I planned to show my work: Cranbrook Academy of Art, Virginia Commonwealth University, Columbus College of Art and Design, and School of Art Institute of Chicago. With only four hours to review with as many schools as possible, I realized a strategy was needed. I decided it was of my best interest to review with a school that was not on the top of my list, so I started with Cranbrook. The review went rather well, especially for the first one! I felt a little rusty, though, due to the fact that I hadn’t attended a review session like this in four years. It was during this interview that I became aware that graduate schools would much rather you apply to one area of the program rather than two. As explained to me, it shows an utter dedication to the program if you only apply to one. I was unsure whether I should be applying to Sculpture or only Fiber Arts, but after discussing it with the Cranbrook representative I knew I should be applying to Fibers. After being given a little confidence and shaking off the nerves, I decided I could apply to the top choice on my list: Virginia Commonwealth University. Up to this point I had been looking very closely at VCU’s program of Fiber Arts under their Crafts and Materials section. After talking with the representative, I felt even more sure of my work and my abilities to succeed in grad school right after undergrad. The representative loved and raved about my work, concepts, passion, techniques, aesthetic, etc. and was more than happy to deliver a copy of my presentation to the director of the Fiber Arts Program. She also asked me if I’d take the time to please visit their school and interview with the director in person. I couldn’t be more thrilled at that moment! All the long nights, lack of funds, and stress I’d been through over the past years in undergrad were finally paying off and showing the possibilities of my future. I left that review with optimism that I’d be able to attend the school of my dreams. My review with CCAD was also rather successful! They were impressed also with my aesthetic, techniques, concepts, and overall drive to do the best work possible. I had already visited CCAD for the Sculpture X convention, so they were familiar with me, but I believe showing my work also aided in my potential to be accepted. I was also pleased with my review with SAIC, as they had an appreciation of my work, but they requested I change the titles of my work. If my reviews with the previous schools had not been successful and they hadn’t said they appreciated my concepts and titles, I would have taken this more to heart. Rather than take away a negative vibe from that review, I’d much rather focus on their appreciation for my aesthetic, professionalism, and abundance of work. I returned from my thrilling adventure last night and mulled over the results. I am elated with all the responses that were given about my work thus far, and now feel I have more confidence to push the send button upon sending applications. I also received an email this morning from CCAD in regard to their thoughts on my review. It was very reassuring to receive, as it discussed my professional presence, their interest in my concept and aesthetic, and also offered me an artist at their school to further investigate for aesthetic inspiration. I very much look forward to making more work after these visits that will have been influenced by thoughts and/or suggestions. It was just what I needed to find even more motivation to keep creating!